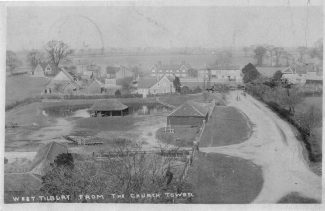 Can anybody tell me if if they have any information such as dates, names of the buildings, occupants etc from these pictures of West Tilbury viewed from the church. Re Tracy Coleman’s comment: I, too, spent my early youth playing cricket for West Tilbury (1961/1965). I was also born in Tilbury and guess what ? I live in Seaview on the Isle Of Wight. I was born in Tilbury but spent a lot of time in West Tilbury as a child. I love St James church it alway held a fascination for me. I now live on The Isle Of Wight but still remember happy days in West Tilbury. My dad, Ivor (Digger) Robinson, used to live in The Bakery – opposite the King’s Head. Anyone remember him or his family? I’ve just discovered this website and read this page with interest as Miss Bertha Bull was my great-aunt. She died at Well House in 1974 at the age of 90, having lived in the house for most of her life. My grandfather Edwin Massey Bull also lived there in his early years. I visited my Auntie Bertha in Well House in 1964 when I was a child and wrote an account of it as I was fascinated by it (it was like going back in time). I still have this account and will type it up if anyone is interested (Peter, you may like to see this). I also have photographs, letters etc as collected by my great aunt (WW1 etc) – not all in good condition but I certainly find them interesting. 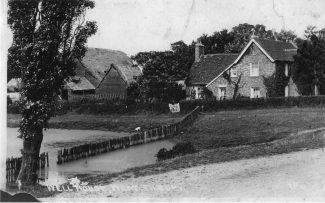 I am currently researching my family history in South Essex. The top picture is of Well House and I am the current owner. The grade 2 listed house is listed as late 19th century but recent investigation by English Heritage suggests that the earliest part of the house dates back to the late 15th century. As well as its use as a farmhouse up to the 60’s it was at one time used as a rectory by the Rev. David Evans in around 1750’s. I have spent the last three and a half years restoring the property exposing much of the original timber framing. 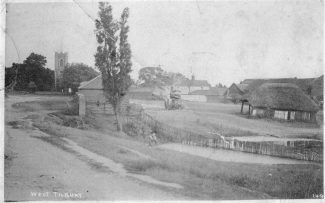 The second picture is taken from Well House looking towards St. James church which is now a private residence. The third picture is taken from the tower of St. James’ looking towards Well House and West Tilbury village. The top picture is of Well House,West Tilbury and a Miss Bull used to live there, she is interred in St James church, West Tilbury with her parents. I feel pretty confident the house in the first picture is Well House and a Miss Ball used to live there up until her demise, which would have been in the sixties. I used to visit there with a friend of Miss Balls, as they worked together at Thames Board Mills. There use to be a farm next to or near the church and I can remember as a child (late forties) walking there at Christmas to pick a chicken for our dinner. The chicken would then be taken home and we would all have the job of plucking it. I can remember the duck pond which if my memory serves me right was opposite the pub.